Our Flowering Fall Orchid brings a bold burst of color to your special recipient's door in a subtle harvest styling they are sure to love. 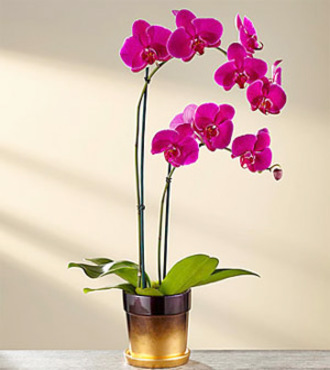 A gorgeous double stemmed phalaenopsis orchid plant arrives blossoming with deep fucshia flowers lined along each of it's stems. With lush green tropical foliage at the base to naturally complement the bright flowers above, this beautiful blooming plant arrives planted in a modern purple and gold cachepot ceramic container to create a memorable thank you, birthday, thinking of you, or hostess gift.